Compatible Red Ink Cartridge with 800 page yield. Equivalent to Pitney Bowes part number: 797-0. Fits the following model(s): Pitney Bowes K700. Buy our high quality compatible ink for Pitney Bowes mailstation K700 with confidence. Join thousands of happy customers who have found our compatible products are equivalent in page yield and print quality. For our compatible products, we offer a 100% Satisfaction Guarantee allowing you to return products within 6 months if you are unsatisfied. Homes or small offices looking for an inexpensive digital poster meter solution don't need to look any further than the Pitney Bowes mailstation K700. This low-cost, all-purpose meter can meet the low volume mailing needs for users looking to send First Class mail, Priority mail, Express, Postcards and even International mail. Further saving users money with its affordable mailstation K700 printer ink, this inkjet mailing device is ideal for light-duty use and has the technology to track meter costs for better budgeting. Users won't need to set aside a lot of space to use this device thanks to its compact size of only 13x10x8 inches. The K700 is able to accept media with a minimum size of 3x5 inches and can handle stick-on labels for media that's too thick to print on. The unit specializes in documents such as envelopes and small packages, and even offers a customization feature for addresses. Several features will enable users to track and protect their postage, such as a lock code that will allow them to prevent unauthorized access to the device and an alert system that will update them when postage funds in the meter run low. The panel also has an LCD that displays important information updates, while the adjacent LED will blink to notify when Pitney Bowes K700 printer ink is low. Requiring only a single red Pitney Bowes K700 ink cartridge to print, this device's system is both inexpensive and efficient. With an estimated maximum yield of 800 pages for each Pitney Bowes K700 ink cartridge, the unit is designed to handle low-volume needs. To further decrease the cost to print, users can opt for remanufactured mailstation K700 ink rather than pricey OEM replacements. 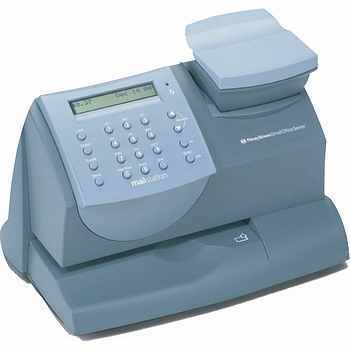 A personal postage meter may seem like an unnecessary device to some, but buyers looking for a professional way to customize their mail and print precise addresses will benefit from the K700. This inkjet unit is also one of the more cost-effective options in its class.